A siege in which gunmen took as many as 170 hostages, killing an estimated 27, at the Radisson Blu hotel in Mali’s capital Bamako has ended. The gunmen, who were originally reported to be releasing people able to recite verses from the Quran, are still thought to be in the premises. Automatic weapon fire was heard from outside the 190-room hotel in the city-centre where security forces have set up a security cordon, according to Agence France Presse. Security sources told AFP the gunmen were “jihadists” who had entered the hotel compound in a car that had diplomatic plates. “It’s all happening on the seventh floor, jihadists are firing in the corridor,” one security source said. French troops were believed to have been stationed at the hotel. 9:00PM: The Al-Murabitoun terror group, headed by Algerian jihadi Mokhtar Belmokhtar, claims it worked alongside Al Qaeda in the Islamic Maghreb (AQIM) in carrying out the attack. 6:45PM: Bill Roggio and Thomas Joscelyn of The Long War Journal warn Al Qaeda has not been “neutralized,” as U.S. Secretary of State John Kerry has insisted. In fact, “Al Qaeda and its regional branches are fighting in more countries today than ever,” they report. BREAKING: UN officials: 2 jihadis killed, 27 people slain in Mali hotel attack, operations ongoing. 6:20PM: Mali has been hit by a wave of jihadi terror this year. Hundreds have been killed by Islamic extremist groups in 2015 alone. 6:00PM: Al Qaeda in Mali has taken responsibility for playing a part in today’s Mali terror attack, reports Mary Chastain Of Breitbart National Security. 5:50PM: Al Qaeda supporters have taken to Twitter to celebrate today’s attacks, the New York Times reports. 5:45PM: United Nations Secretary-General Ban Ki Moon condemns “the horrific attack” in Mali. “The United Nations Multidimensional Integrated Stabilization Mission in Mali (MINUSMA) has been assisting the Malian authorities in the handling of this crisis,” he adds. 5:35PM: The Islamist leader of the Al-Mourabitoun group which claims responsibility for the attack, Moktar Belmoktar, said the attack was carried out to free fellow fighters from Mali’s prisons and to stop attacks against northern Malians. Algerian, German, Belgian, Canadian, Chinese, Ivorian, Spanish, American, French, Indian, Moroccan, Russian, Senegalese and Turkish. 5:25PM: The Pentagon told the BBC that two Americans were involved in the hostage operation. One was from US Special Operations, on a temporary assignment to the US embassy in Bamako, he assisted at the hotel but was not part of the final raid. The second, a Department of Defense staffer, was in a U.S.-Mali Joint Operations Centre “offering advice” as the siege unfolded. The Pentagon has confirmed none of the 22 U.S. civilians and special forces operatives were injured in the operation. 4:10pm: It now appears that the hostages have all been freed by the Mali-led operation. Reuters reports UN peacekeepers saw 27 bodies in the hotel. 12 corpses were seen in the basement, a further 15 on the second floor. At least two terrorists have been killed and as many as four are thought to be holed up in one of the hotel rooms, but confusion remains as to the precise number of gunmen. Some sources are saying the two dead gunmen were the only attackers. 3:50PM: A Belgian government official called Geoffrey Dieudonne has been confirmed as one of the 18 reported fatalities. 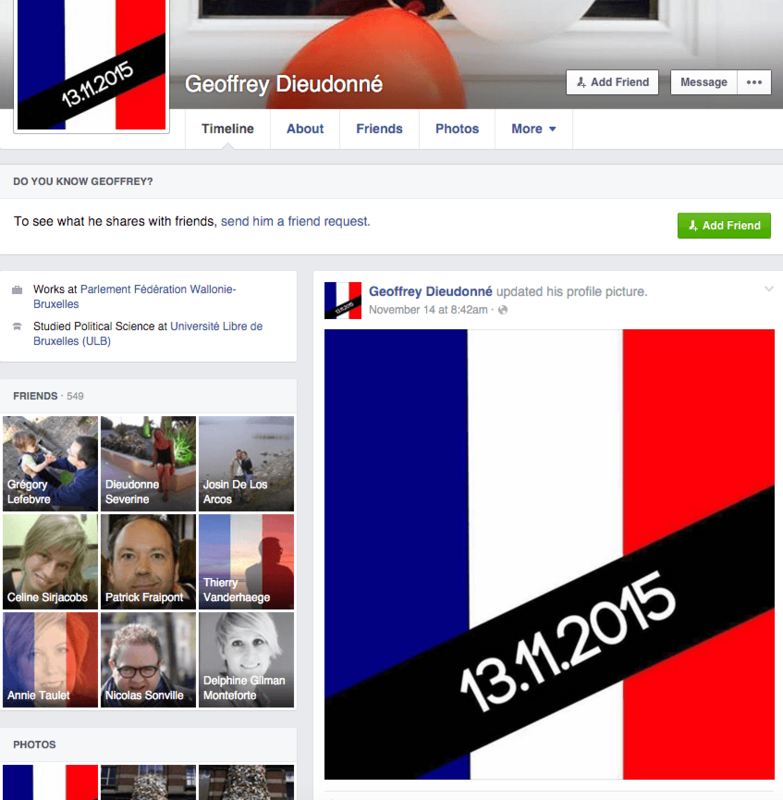 On 14 November, just after the Paris Attacks, Mr. Dieudonne expressed his solidarity with those affected by the Islamic State atrocity by adopting the French flag as his profile picture with the date of the attacks written on a black banner. Facebook profile of Geoffrey Dieudonne. 3:47PM: The Malian President’s office has tweeted thanks to the security forces and to friendly countries for their support in the attacks. “This morning Bamako, Mali, a country which is resisting jihadism with so much spirit, has been attacked. “A hostage situation is in progress. I want to express here once again France’s total support for our friends in Mali and Malian democracy. 3:41PM: The BBC has reported how the rescue operation unfolded. First, Malian security forces, supported by UN troops as well as French and U.S .special forces, set up a cordon. They then entered the hotel and brought out hostages at a rate of one or two roughly every 20 minutes. As the liberators moved from floor to floor shooting was heard, with the attackers firing most heavily when the rescuers reached the fifth and seventh floors. 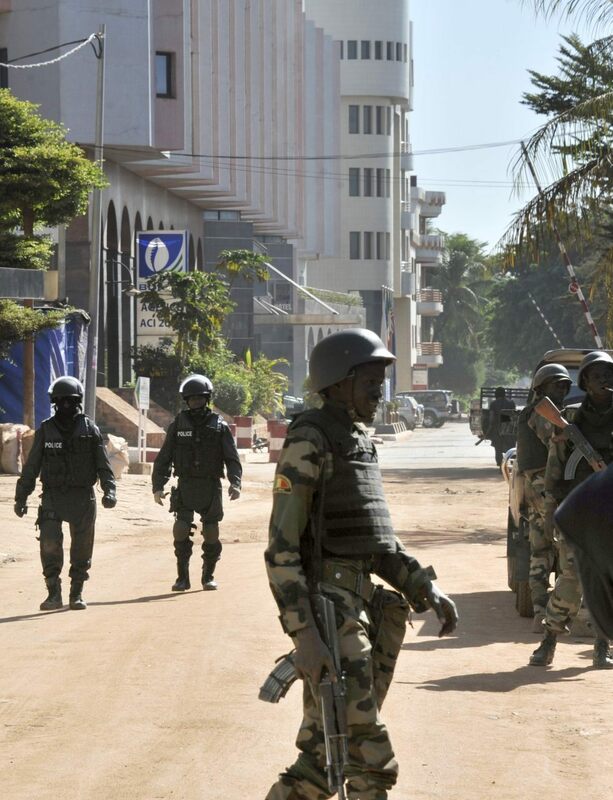 3:35PM: The Malian security minister has announced that the gunmen are “holding no more hostages”, reports AFP. The death toll may have risen to 18. 3:33PM: British Prime Minister David Cameron has tweeted his support for Mali. PM: My thoughts are with those caught up in the #Bamako attack. We stand with our partners around the world in the fight against terrorism. 3:29PM: Besides Mali, at least nine countries have citizens among the hostages — Algeria, Morocco, Germany, Belgium, China, France, India, Turkey and America. 3:23PM: The Malian security minister has listed 89 freed hostages, excluding the six U.S. citizens freed by U.S. Special Forces. It is believed that 43 hostages remain in the building. 3:15PM: The freed hostage who said he heard attackers speaking in English as he hid under his hotel bed — Guinean singer Sakouba ‘Bambino’ Diabate — says the accents were Nigerian, according to Le Monde. 3:10PM: Seven Algerians, six of which are diplomats, and two Russian airline workers are among the freed hostages. 3:01PM: Northern Mali’s Al-Mourabitoun, a group of mostly Tuaregs and Arabs but also Algerians, Tunisians and other nationalities, has claimed responsibility on Twitter. The claim of the Al-Qaeda offshoot is as yet unverified. 2:56PM: An Al-Qaeda affiliate group has claimed that they are behind today’s terror attack. 2:54PM: A military spokesman for US Africa Command has announced that six U.S. citizens have been freed by American special forces. 2:52PM: The Indian government confirms all 20 of its citizens have been freed. 2:50PM: French special forces are reported to have arrived at the hotel where an estimated 138 hostages, including 13 staff, are being held by terrorists. 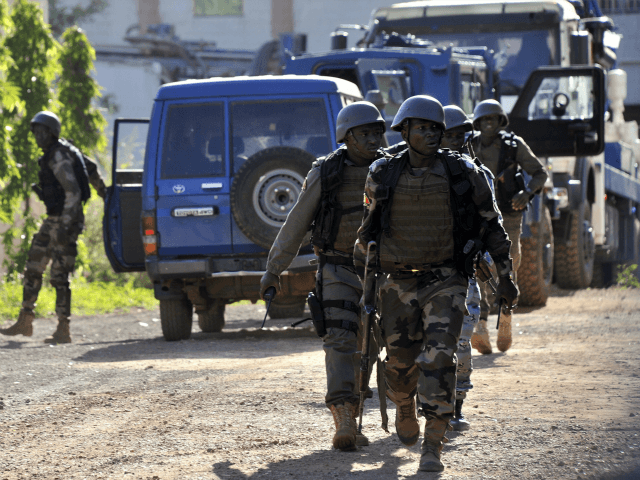 “Special Operations Command Forward-North and West Africa personnel are currently assisting hostage recovery efforts at the Radisson Blu Hotel in Bamako. 2:41PM: The U.S. State Department believes U.S. citizens might be present at the hotel. 1:28PM: The hotel has announced an information telephone line for families of potential hostages. 1:23pm: The British Foreign Office has issued further advice to British people in Mali. #Mali: Updated travel advice https://t.co/b1XtnaAK1D British nationals advised to remain indoors & follow instructions of local authorities. 1:19pm: US and French troops accompanied Malian forces entering the hotel, Bloomberg is reporting. The news is said to come via a local United Nations official’s e-mail. 1:03PM: 125 guests and 13 staff are reported still to be held hostage, but sources warn the numbers are “fluid”. 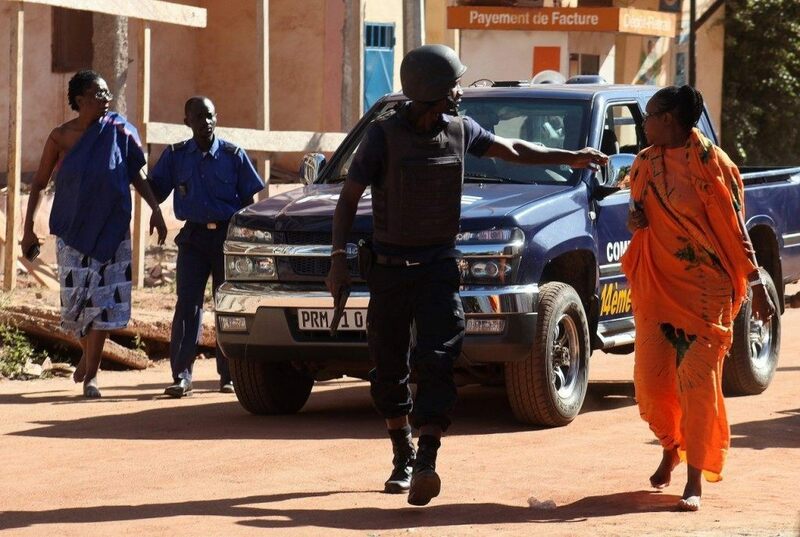 12:56PM: Malian journalist Moussa Konda reports security forces told him they were able to free hostages because attackers did not know the hotel layout very well. 12:53PM: There is still confusion over numbers in the siege situation. Hostage numbers are now estimated to have been between 150 to 180 and attackers numbering between two and 13. Turkish, French, Indian, Chinese and Guinean citizens were staying at the hotel which was reported to be 90 per cent occupied. 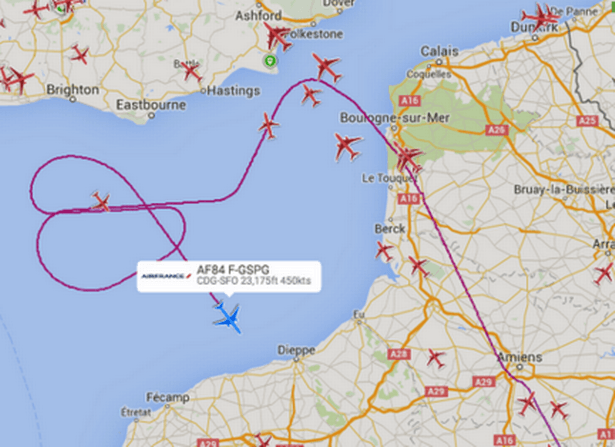 12:45PM: Amid reports that passengers were told all flights between Paris and the US have been cancelled, flight radar shows an Air France Boeing 777-200 from Paris to San Francisco performing several loops and a u-turn over the English Channel before returning to France, reports The Mirror. 12:18PM: Around 40-50 members of the French counter-terrorist and hostage rescue specialist GIGN anti-terror unit are en route to Mali. 12:14PM: Film footage from inside and outside the hotel recorded by Malian television has been broadcast on Sky News. 12:13PM: Air France confirms 12 of their crew who were in the hotel, two pilots and 10 cabin crew, have been “extracted” from the siege. All Air France flights to Mali have been suspended. 12:03PM: The hotel is being cleared by floor by floor by Malian special forces, sporadic gunfire heard outside, reports Sky News. 12:01PM: The French Foreign Minister, Laurent Fabius, tells a press conference France will take “all steps necessary” to combat the Bamako attackers, as a crisis unit is set up in the local French embassy. 11:56AM: 80 of the 170 hostages taken (of whom 140 were guests and 30 staff) have been freed, according to Reuters. 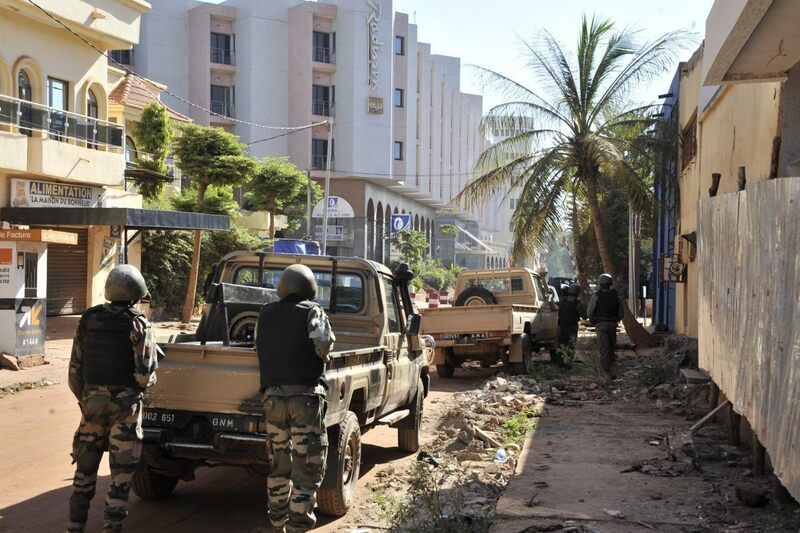 11.54AM: Malian special forces, backed by intelligence from the French military, are confirmed to have entered the hotel. 11:50AM: Images from the siege. 11:40AM: Air France has cancelled a flight to Mali. 11:35AM: An escaped hotel staff member says the attackers have taken the hostages underground to a basement of car parks and storage rooms which is more difficult to access than the upper floors, according to Jeune Afrique. 11:24AM: Aaron Klein at Breitbart Jerusalem points to a possible Mali connection to last week’s Paris attacks. Last year a well-known jihadi website with ties to al-Qaida called on supporters to carry out lone wolf attacks inside France with focus on soft targets. Significantly, the al Minbar Jihadi Media Network also called for the assassination of President Francois Hollande, who was inside the soccer stadium hit by two suicide bombers during the Paris attacks. The Al Minbar Jihadi Media Network publishes propaganda for al Qaeda affiliates, including al-Qaeda in the Maghreb. It is particularly active in Mali. The website said its anti-France posters came in response to French military campaigns in Mali and the Central African Republic, where France has maintained 2,000 soldiers as part of a 6,000-strong African Union peacekeeping mission. The Mali branch of Al-Qaeda in the Maghreb is particularly capable and has international connections. It has been led by Algerian terrorist Mokhtar Belmokhtar, now the strongman of the group Al-Murabitoun. Belmoktar claimed responsibility for a January 2013 attack on an Algeria gas facility in which at last 39 foreign hostages were killed during a three-day siege. He has also been connected to the September 11, 2012 Benghazi attack. 11:21AM: The UN’s Minusma taskforce has joined the Mali security services in dealing with the siege. 11:11AM: BBC French Service’s Mamadou Moussa says that a radical Islamist militant leader in Mali had called on his followers to target French interests in the country. “There is a new terrorist attack taking place in Mali at the moment. Hostages have been taken at the Radisson hotel – a place everybody knows. “There are men and women, citizens who are just doing their jobs and have been targeted. “I condemn in the strongest possible way this barbaric act which has nothing to do with religion. “I reaffirm our unending support for our brother Ibrahim Boubacar Keïta (Mali’s president) and all the people of Mali. 11:05AM: Three Turkish airline workers have escaped from the hotel, reports Reuters. 10:57AM: Security services convinced that the attack has been launched by Al Qaeda affiliate Ansar al Dine. MALI UPDATE: CNN reports US Special Forces just stormed the Radisson Blu Hotel. More than 170 hostages. 10:38AM: The Mirror reported earlier that the hotel is home to French soldiers taking part in Operation Barkhane, a French anti-terror operation which began in August 2014 and involves a 3,000 strong French force.